Q: Are we required to know Japanese language ? A: Yes, you are. For example, almost all the documents are required to be made in Japanese. And you have to go to Immigration Bureau, when the officers talk to you in Japanese in order to confirm your ability of language skill, etc. However, you can apply for permanent residence according to our advice and support. And we can go and apply for permanent residence instead of yourself. So, you need not go to the bureau if you ask me. In order to get permanent residence in Japan, what is needed? Can I have permanent residence in Japan? There are many such inquiries evryday in our law office. In fact, the requirements for permanent residence are not necessarily fixed. There are some exceptional cases also in this permanent residency or a permanent residence application. Permanent residence in Japan. The reasons should differ one by one. However, if there is no permanent residency, you will become always uneasy by the renewal of the period of Japanese visa. There is no guarantee to which renewal of Japanese visa is permitted. Moreover, in practice, when a bank also lends money, it thinks as important whether you have a permanent residency in Japan. This is a proof with the unstable legal status of a foreigner in case he/she has no permanent residence status in Japan. Is the application procedure of permanent residence in Japan also difficult? This also will differ one by one. Even if you are good at Japanese, you will go to various public offices here and there repeatedly after all in Japan. Documents for permanent residence will also be rewritten repeatedly. It may spend about one month. You will worry also about how to write a statement of reasons for permanent residence. You may translate documents without the necessity of translating and may give a translation company useless remuneration. It is an error if you think that a lot of documents should be submitted. But also it is improper for them to be too few. It is important to draw up required and sufficient documents. When we make a permanent residence application, the data for pros, the trend of Japanese precedent information and the Japanese authorities, etc. are synthesized, and documents are drawn up. And we have the data which we asked directly to the former Director General of Immigration Bureau in Japan. In a permanent residence application in Japan, required documents are specified once. However, there are various other documents which can be used in fact. Moreover, it is inadequate to submit only the specified documents. Only the Japanese lawyers for the Immigration Bureau know such things. Moreover, when we treat the application of permanent residence, the knowledge and experience of other Status of Residence can be useful. Please do not resign yourself. Please consult immediately. There are remedies. However, the aid may be unable to be given, when there is a fatal flaw which cannot recover easily in a first-time application. Then, we will recommend you to ask us from the beginning. 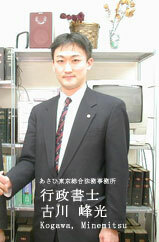 To: the clients who would like to want Japanese permanent residence in Japan. The permanent resident -specialist of this office will guide you in the Immigration Bureau. We will support the negotiation between our clients and the Immigration Bureau about permanent residence application.